The fall in apparel exports has compelled the region-based exporters, especially from Punjab and Haryana, to look towards new and emerging markets. They are eyeing markets that have seen an extraordinary year-on-year increase in demand for Indian apparels in the past two years. These countries include the US, UK, Japan, Chile and Israel. Overall, exports in these markets have risen between 23 and 51%. According to exporters, the demand from key import markets such as the Middle-East, France, Sri Lanka and Sudan has been continuously on the decline in the recent months. The exports suffered a negative growth between 16 and 49%. The problem is further compounded by increasing competition from other exporting nations such as Cambodia and Bangladesh which enjoy low labour costs than India. “There has been consistent decline in traditional markets like France, the United Arab Emirates, Sri Lanka and Sudan. Having received setback, the exporters are eyeing new markets like the US, Japan, the UK and Israel,” said Harish Dua, managing director of Ludhiana-based KG Exports. Major apparel hubs in the northern region are in Ludhiana, Jalandhar, Panipat, Gurugram and Noida. Apparel clusters in the three northern states employ over two million workers. Around 200 textile exporters are based out of Punjab and Haryana alone. Tamil Nadu is India’s biggest apparel exporter, followed by Maharashtra, Delhi, Karnataka and Punjab. These five states account for over 92% of India’s apparel exports. The major exporting countries are the US, the EU (mostly Germany, France, Belgium, Spain, and the Netherlands), the UK, and the UAE. These four markets import 75% of India’s apparel exports. The apparels exported to these countries are mainly made of cotton, synthetic and polyester. Cotton and synthetic are domestically produced whereas the demand for polyester is met by domestic manufacturers as well as through import. According to ICRA, India’s apparel exports are estimated to de-grow by 4-5% in FY2019, following a similar de-growth of 4% in FY 2018 and modest growth rates of 1% and 3% in FY2016 and FY2017, respectively. 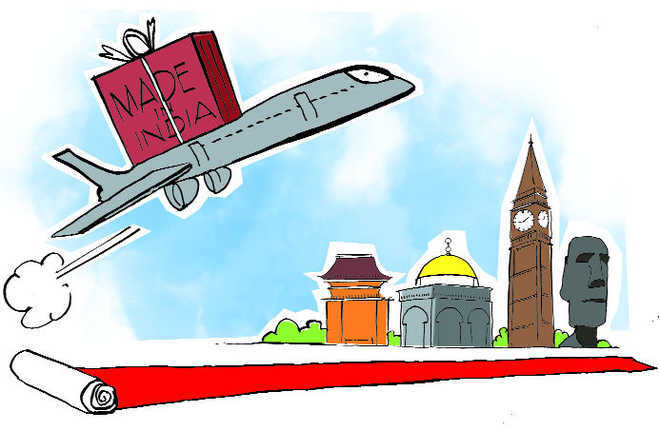 “Though the exporters are targeting new countries, India has not been able to capitalise on the opportunity, mainly because of cost advantage enjoyed by Bangladesh and Vietnam,” said Narinder Chugh, managing director of Ludhiana-based Million Exporter (P) Ltd. According to Drip Capita, some policy changes and interventions could give boost to the sector it needs. As India can’t compete on labour costs, the focus should be on expanding schemes for tech upgrades and introducing more policies that incentivise apparel exporters to upgrade technology.